The Enforcer 8 is a great deck light to have; it’s only 9” long and just 2.2” wide; that’s shorter than a ruler! Just store it with your gear, so you’ll always have it with you. 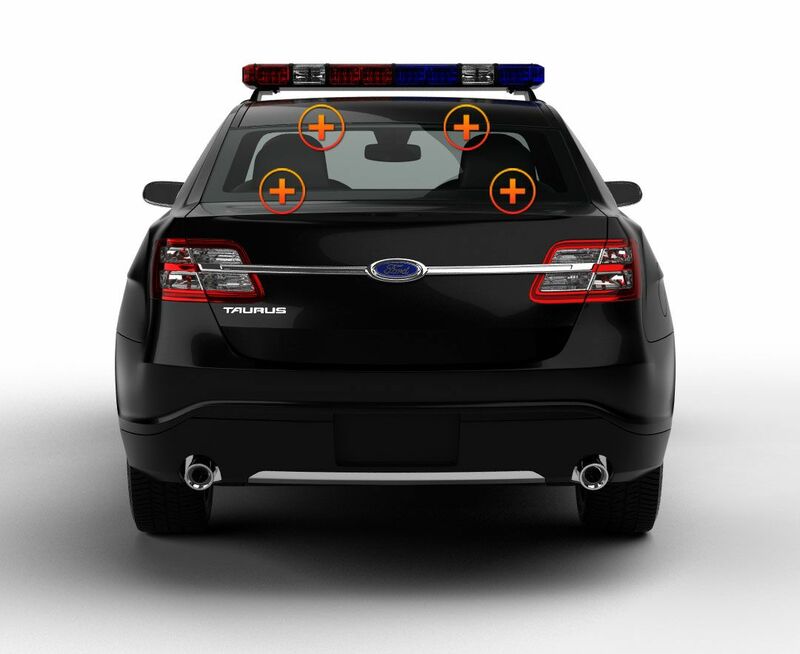 It’s quick and easy to setup, too, just push it in place and the widely spaced, powerful suction cups will hold this emergency vehicle light tight. The newly designed bracket allows you to slide the light to exactly where you want the high-intensity TIR beam to shine. The flashback shield is also adjustable and removable as well. 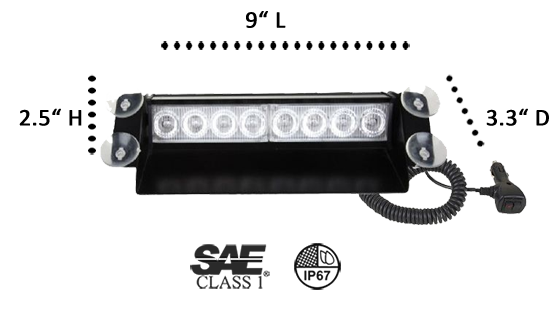 8 SAE Class 1 Generation IV LEDs produce 24 watts of steady, brilliant light; 26 flash patterns turns the Enforcer 8 into a double, triple, quad….strobing light show that can be seen for miles. 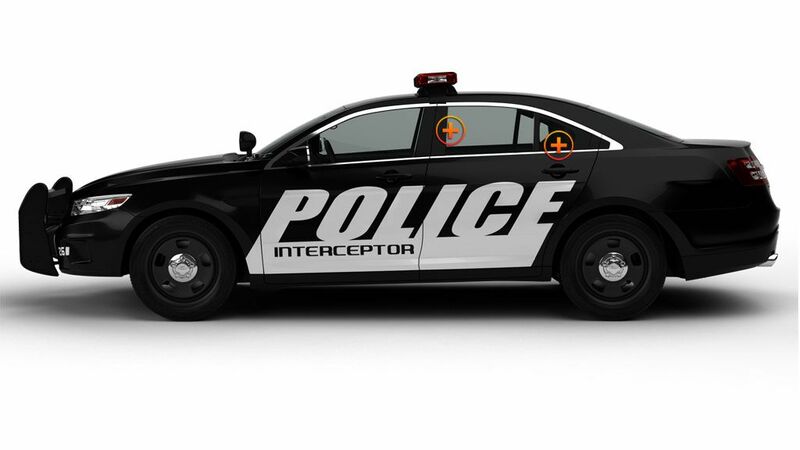 Put the Enforcer on the dash or deck of your police or emergency vehicle, high or low; the black aluminum housing and black flashback shield are barely visible to passers-by making it perfect for undercover police work. It comes in 5 solid and 7 split-color combination; you choose the color that’s right for your job. The ‘8’ has a cigarette lighter power plug that has both an ON/OFF and Flash Pattern switch and comes with a 9’ expandable power cord. If you have your own Enforcer 8, you know you’ll always have all the light you need...To READY, SET, GO….no matter what you’re driving! 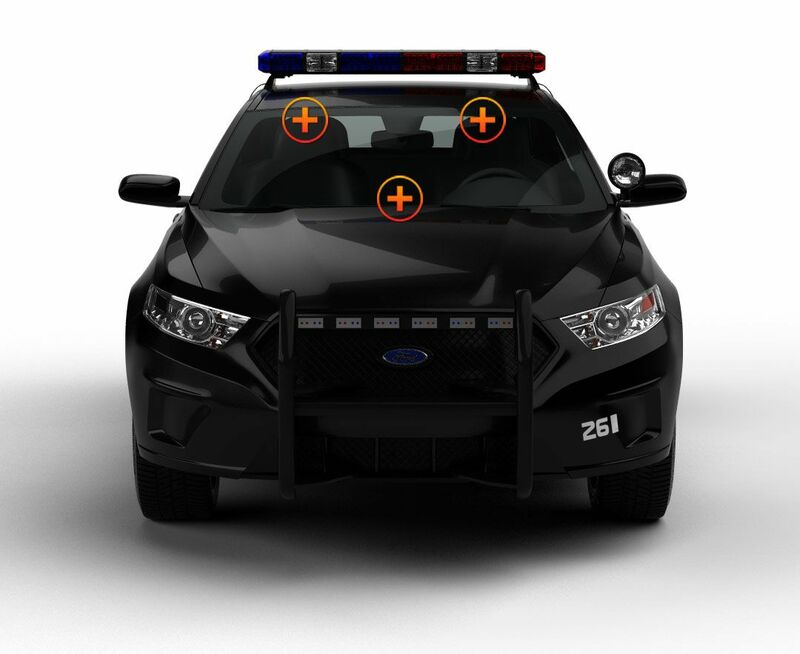 If you are wondering which emergency vehicle light is right for you, just give us a call….We Love “to Talk Lights!” ETD has a highly trained Customer Service Team that will gladly answer any questions about our products. We know we have a lot of different kinds of lights and sometimes you might be a bit confused about which light does what! Just give us a call and we will be more than happy to help you sort it all out! Chat with us right here, or check out your favorite Social Media Site...We’re There! You can use this efficient little light in a truck, an SUV, a van or a car if you switch vehicles. It only takes a few seconds to mount it with the suction cups, and it only takes a minute to readjust the bar to point in the desired direction. When you're ready to use it, you plug it into the electronic outlet. There's a switch to turn it on and off. There are more than 20 flash patterns and a few color choices for both solid colors and split combinations. A coworker and I tested this light after I received it. Visibility was great for darkness and daylight. Actually surprised a bit because of it's small size. It's a little more than 2 inches in height and about 9 inches in length. There don't seem to be any disadvantageous features of this light. The only thing I can think of is if you're looking for a permanent light, it may not be ideal. It's designed to be sturdy but easy to remove. It uses suction cups to attach to the dash. Personally, I like the suction cups since I like to move the light around sometimes. I recommend this light for the benefits, the affordable price and the long warranty. The pictures and video demo of this product don't do it justice. It's one heck of a bright little light. IT adjusts easily and the shield does a good job preventing too much light flashback. Installation was quick and painless. Plugged it in and off I went. I think my favorite features with this light are the color choices and flash pattern choices, it has plenty to choose from. Overall seems to be a good all-purpose light. Suction cups have been secure so far with good light angle. The power cord length is just right as well and isn't in the way. I was hesitant to buy this at first when I saw the suction cup attachment method. I gave this product a chance because it says the warranty is good for five years. Once it was installed I tugged lightly and pushed on the unit, and it didn't move at all. I had to pull pretty hard to get it off again, but that's good since I want something that will stay put. I could tell that the light was durable when I handled the housing of it. I always like to try to wiggle everything, and my policy is that anything that's a little loose is probably not good quality. The light didn't wiggle one bit. At first, I was skeptical about this light. I put it in my car and plugged it into the cigarette lighter. I was pretty impressed with how well it stayed attached with the suction cups. Nice and bright in daylight as well. There's definitely no way someone wouldn't see it in their mirrors or as they're approaching. I also tried it at night. The light was very bright and strong. I like that it's adjustable. I've tried some other lights on the market that are similar. The problem with those is that a lot of them have a shinier housing or finish. They also tend to be a little thicker. This light is slim, small and has a black housing that blends well with the dash. To me, this is important for undercover work since I see people looking in the car from time to time. I never want to take the chance of having someone spot a dash light. If I really want to conceal this light when I'm sure I won't need it for a little bit, I can just remove it from the dash. It attaches with suction cups. I had to use some strength to pull it off, but that's good since it just shows how securely it can attach to a surface. This is a well-made little dash light. This is one of the simplest lights on the market. There are no complicated installation instructions, messy wiring or any other hassles. The light plugs into the cigarette outlet with a curly power cord that expands. The suction cups are secure and keep it in place really well. For its size, this light puts out a lot of brightness. Plenty of patterns to choose from as well. For undercover work, this is a really useful little light. You might not think so at first to look at its small size, but it has an impressive amount of light. You can remove it from the dash quickly too. It sticks with suction cups. You can move it around easily. One of the best things about this light is that you just plug it into the cigarette lighter. Very easy to use.